Todd Davidson and Paul Stapleton with the Rangers’ 40th anniversary retro jersey. Davidson, the owner of Davidson Truck and Tractor, is a Rangers alumni and a long-time sponsor of the team. Davidson helped sponsor the new retro jerseys. Stapleton is the Ranger team captain and has played with the Rangers for 17 years. The NCHL Champion Moosomin Rangers kick off their 40th anniversary season with a game against the Rivers Jets at the Communiplex this Friday, November 5. The Rangers will be sporting retro jerseys for the game. Also on the 40th anniversary weekend, there will be a Rangers Alumni game on Saturday at 1 pm, and a Saskatchewan Draft Eligible AA Bantam Game at 3 pm Saturday. Saturday night will feature an SJHL game between the 2016-16 Viterra Division Champion Weyburn Red Wings and the 2014 Royal Bank Championship Yorkton Terriers. During the game, the Moosomin Parks and Recreation Awards will be presented. The Mayor’s Award of Distinction is going to Peter Nabholz, the Senior Rangers have been named Moosomin’s Team of the Year, the Community Councillors’ Achievement Award is going to Creative Vision Productions, the Corporate Community Builder Award will go to PotashCorp Rocanville, and the Meritorious Service Award is going to Bill Van Meer. The evening will be capped off with a Rangers alumni social. 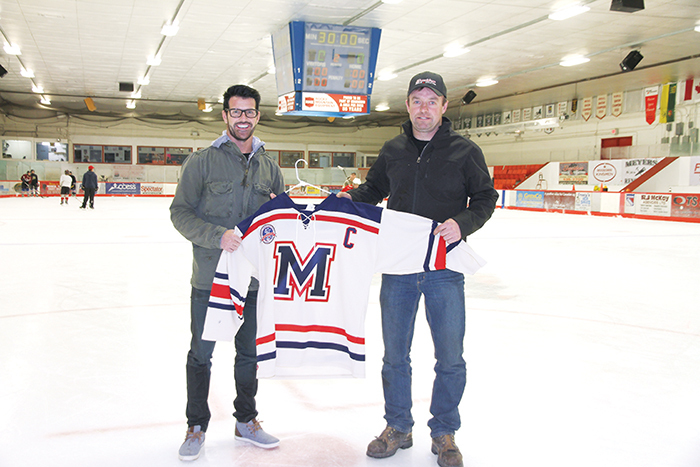 The weekend has been planned as a fundraiser for both the Moosomin Rangers and the new PotashCorp Sportsplex. Ross Shaw, the manager of the Moosomin Rangers, says the team is excited to be celebrating its 40th anniversary season. Shaw says it’s an accomplishment to be able to ice a senior hockey team for 40 years straight. “There are enough alumni around from other championship Ranger teams that I think they will find it interesting looking at old pictures and things like that. “This weekend with the home opener we are going to have an alumni night, and hang the championship banner up at the home opener. There is a possibility of an alumni lunch on the Saturday and just a get together for the guys—whoever is in the area that wants to get together and have some fun and reminisce and see a couple of hockey games including the junior game on Saturday night. “The retro jerseys will be worn throughout the season at different times. We’re hoping to get lots of wear out of them and I think the guys are pretty excited about them. Shaw says the Rangers are looking to ice another strong team this season. He says the team will be comparable to last year’s squad. “Most of the guys are returning so it should be very similar,” he says. “We’ve lost Josh Elmes. He is pursuing hockey in the U.S. at a higher calibre. Naturally he was a very important piece of the team but we’ve still kept intact with the bulk of our team. We’ve got two other guys coming in that are pretty talented also so I don’t think it will be a huge impact. He was a leader and a very good hockey player, there is no question we will miss him. But I think with the new additions we will help fill that gap. “Most of the guys are returning with some new faces. We have two new faces from Brandon and we have two returning who were from Brandon last year—Jaxon Elmes and Jackson Wallis, which were pretty key also—and we’ve added Kelly Prince and Braeden Boschman for two more new players. We are missing Troy Heywood, he has pursued hockey elsewhere also. There are eight teams in the North Central Hockey League this year, with the addition of Foxwarren and Swan River. The Kenton team has been folded into a new team called the Rivers Jets. The league will be split into a north and south division this year due to the number of teams. The Rangers will play in the south division with Virden, Miniota-Elkhorn, and Rivers. They will play four games against each of the south teams—two home and two away—and play one home game and one away game against each of the north teams. “This works out really good because both halves have minimal travel,” says Shaw. In the playoffs, each division will play two rounds, and the winner of the north and south division will play in the final. On the weekend the Rangers played a number of exhibition games against Whitewood to warm up for the season. They play Rivers in the home opener in Moosomin this Friday. “I think they are looking pretty good,” says Shaw. “It’s always key to get off to a good start because sometimes you can catch teams that aren’t on the ice as much. We’ve probably been on the ice just as much as last year at this point in time. As they battled their way to a championship finish, the Rangers drew large crowds last season. Shaw says they are hoping for strong fan support again this season. “Any time you start to win, your fan support goes up,” he says. “People like to see a winning team or a competitive team.